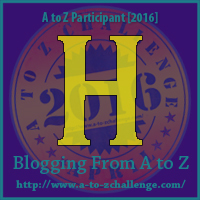 I've recently blogged this; but it's so good and it also relates to last year so I'm repeating it for the A to Z Challenge - apologies to my regular readers! It's a mug with a hat on! Not only does it keep my tea warm, but it stops flying glass from making my tea crunchy! It also has a strainer so I can make a mug of loose leaf tea straight into the mug - Winner! Have you had a thoughtful gift given to you? Awesome gift :) My husband once came home with a Kitchen Aid for me, completely out of the blue, because I love to bake. I love unexpected presents and this one was not only thoughtful, but because my birthday is the week before Christmas and he'd bought me a combined gift to open for Christmas, he bought me this so that I could have something to open on my birthday. Was really stoked. 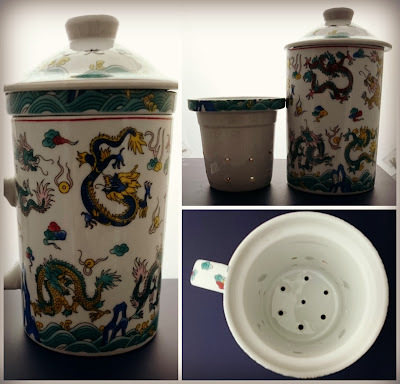 What a wonderful gift and a delightful mug to have - love the strainer inside!! I might get one of these for my husband as he is the loose leaf Earl Grey tea drinker in this family - I'll have to go looking for one on-line because I don't think I've ever seen anything like it in a shop. 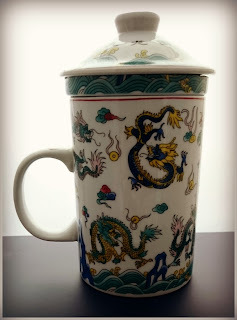 It was in one of our local hippy shops, not the world's most expensive cup but perfect for me! If he likes loose leaf Earl Grey might I recommend Imperial Teas in Lincoln, they have an online shop, my favourite is Earl Grey Blue Flower! A lovely and thoughtful present. I am a huge tea drinker and I expect that the tea tastes nicer in this mug than any other and all because if the extra ingredient of love. ...and without the ingredient of glass :) It does make me smile whenever I make it before/during a torch session. A thoughtful gift that I didn't think was so thoughtful at the time was the birthday that my now-husband gave me a shop vac. We had been together for about a year and half, and we were in the process of finishing some renovations to my house so that I could sell it and we could move in together. But, my first thought upon opening the shop vac was not "how thoughtful!" It was more along the lines of "WTF?!?" In hindsight, his intentions were really sweet. This was to help us move in together. He was just excited about starting the next phase of our relationship. Clearly, I forgave the shop vac ;) It's a bit of a joke between us now. And he really does give thoughtful gifts, like the squirrel-proof birdfeeder so that the squirrels wouldn't empty my birdfeeder every day. And the Lego bird set. I love that dragon mug! Yes a very thoughtful gift :) my husband got me an embosser - even though it means I'm cutting out all manner of fiddly paper bits, and tiny bits of paper attach themselves everywhere! I love dragons, they're one of my favourite creatures in books and art. I work from home office wise and my shredder does much the same, but not half as exciting! It's the glass pinging off my bead rods into my tea that was the problem... that and the fact I forget I have a cup of tea when I'm making so it keeps it hot inbetween beads!